Software Defined Video over Ethernet (SDVoE™) is the most widely adopted standardized solution for distributing and managing AV signals on an off the shelf Ethernet network. SDVoE is the only complete hardware and software platform available to AV equipment manufacturers for zero latency AV over IP. SDVoE’s comprehensive API provides a single interface to control systems of devices, making it easy to manage complex tasks like video routing, scaling, aspect ratio management, video wall processing, image compositing, audio downmixing, and much more. 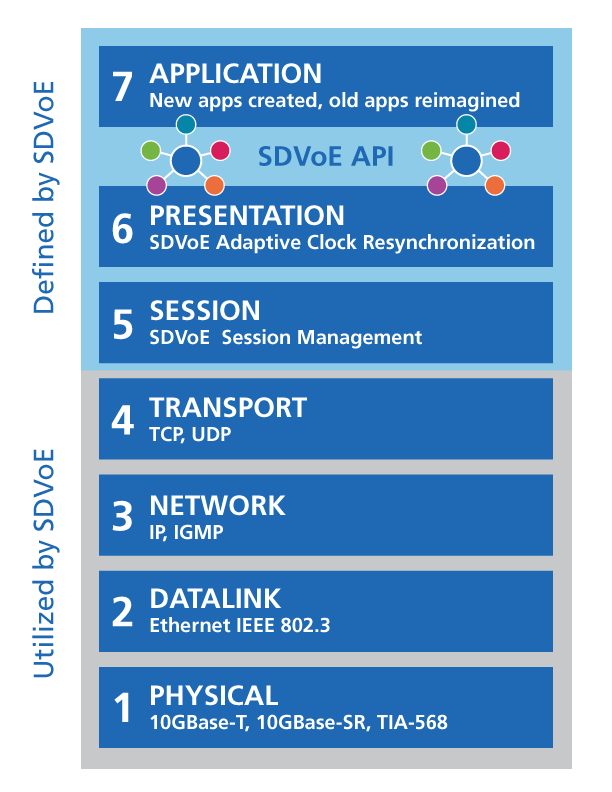 A Semtech innovation, BlueRiver™ technology and AptoVision product platform are the core technology that drive SDVoE. Together, BlueRiver and SDVoE are reshaping the Pro AV industry, enabling off-the-shelf Ethernet networks to deliver dramatically better performance, flexibility and scalability than traditional matrix switch-based approaches. The SDVoE Alliance is the only technology alliance in pro AV offering a full stack solution. Other technologies provide only partial solutions, for example: how to move bits down a wire or how to deal with timing errors on a network. Each of these pieces of the puzzle are important, but without SDVoE, manufacturers of Pro AV equipment are left to source and integrate parts and pieces. Worse yet, each of these patchwork systems are specific and proprietary to individual manufacturers, and do not interoperate with one another. Instead, SDVoE addresses the full 7-layer OSI stack with solutions at every layer. This helps to ensure interoperability, and creates a clean interface between hardware and software, so that even pure software developers can participate by creating applications on the platform that are agnostic to hardware. 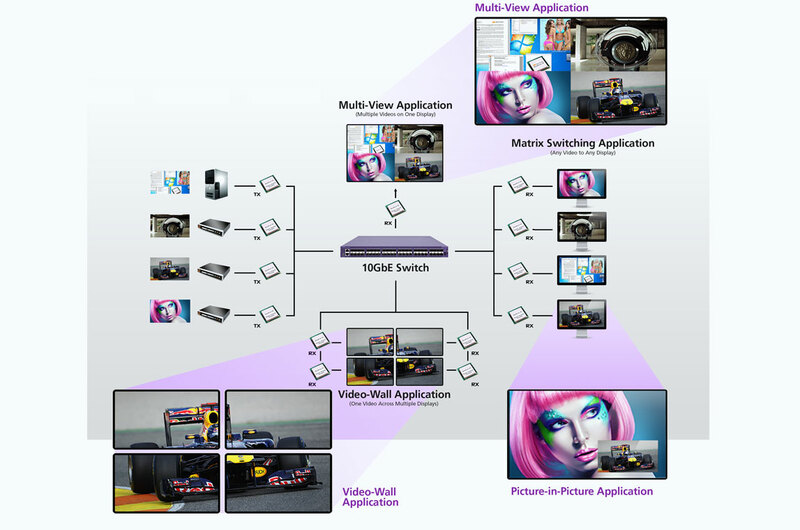 Semtech created a flexible hardware and software platform that enables many applications including matrix switches, KVM switches, video walls controllers, and multiview image processors. The technology can also be integrated into sources and displays, all networkable. BlueRiver technology lies at the heart of SDVoE, paving the way for the creation of whole new classes of applications: Education, Medical/Healthcare, Corporate/Enterprise, Entertainment/Hospitality/Retail, Cultural & Event Centers, House of Worship, Government, Military, Simulation & Training, Industrial, Control Room, Security, and more. Ethernet switches cost up to 90% less per port than custom AV switches. Ethernet ports are fully bi-directional; each port may be an AV input or output. Easy capacity expansion via high bandwidth up-links, no more replacing systems when I/O count exceeded. Ethernet switches deliver 48 ports or more per 1U of rack space. Custom AV switches consume 4X as much space. SDVoE technology allows a full gigabit channel to be reserved for data traffic, ensuring no bottlenecks. Read how BlueRiver technology solves latency in AV-over-IP Systems. Learn about our SDVoE solutions. Join the dedicated members of the SDVoE Alliance.